I flew in for this game. I am missing days of class to be here. I am sitting in not cheap seats. I am getting loads of crap from Cardinals fan. I believe we're going to whip their asses the next two games. Smithian: the ultimate Nats fan. No. I am just pointing out someone can put a lot into the team and still be positive. 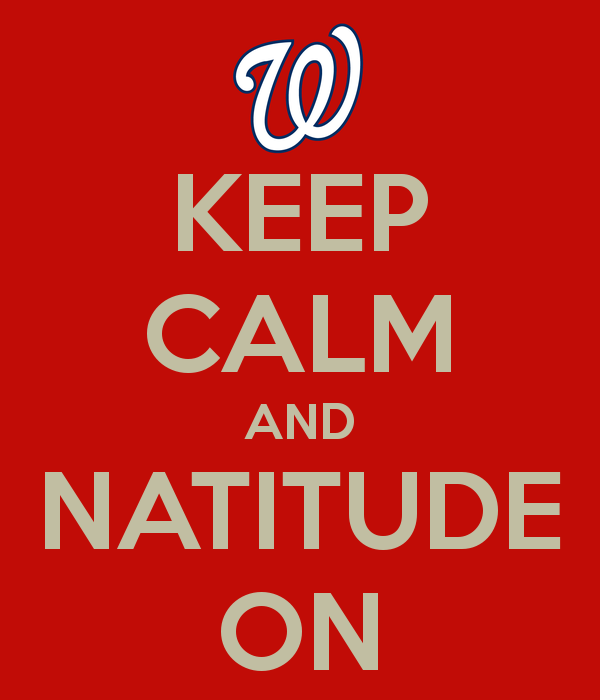 Considering the comprehensive nature of the teams meltdown I find it hard to believe that the Nats stand a chance but Ill cheer until the fat lady sings. My throat is still sore from trying to drum up Lets go nats when the rest of the stadium went silent. I invented the BEAST MODE CLAP CLAP cheer. Everytime I teased a guy with 2 strikes; DeCalso's gonna strike out!, Guess what, they struck out! However, I don't have the magic to get the NATS bats going with the Bases Loaded. I want to sit next to you. People like you at the stadium are awesome. if we do lose tomorrow, i'm posting the final scene from "Life of Brian"
That's just the right speech. Look at the San Francisco-Cincinatti series: The Giants got outscored 14-2 in the first two games, including a 9-0 2-hit beatdown at their own park. The series moved to Cincinatti and the Giants responded by winning a close game yesterday and an 8-3 thumping today. They looked like they were doomed for the sweep and have now come almost all the way back and have a good chance to take the series. That's enough to make me think we have at least some hope. Also, these very same Cardinals were down 1-2 to the 102-win Phillies in the LDS last year and they came back to win. No reason we can't do it to them. I wanted to be mad about my favorite team losing a playoff game I've ever been to but this topic ruined it. It has clay-mation Rudolph and no one can't be sad when they watch clay-mation Rudolph. Also, I do think I saw Smithian in the concourse area. I wasn't sure though. Thanks for reminding me of that ugly town I live in, lol. The hunk walking with a J Werth beard shirt?